Before I was Oklahoma’s Teacher of the Year, I was best known as the Teach Like Me Campaign Founder. As I travel the state and region, I share the campaign with educators and future educators and many are eager to get involved. So, for all the supporters and newcomers, here are seven ways to get involved with Teach Like Me! 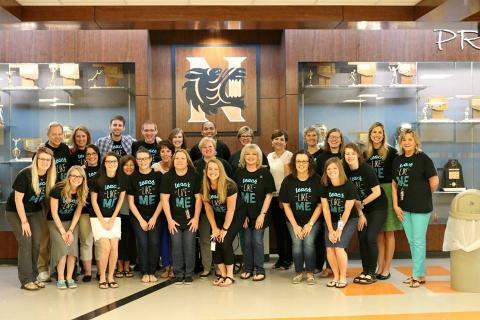 The Teach Like Me Campaign exists solely on social media sites. To stay-up-to-date, you've got to connect with us on Facebook, Instagram, Twitter and YouTube. This is the easiest part and it's your key to connecting with like-minded educators and supporters who want to boost morale among current educators and encourage future educators. This is how you'll participate in #TeachLikeMe Day, too! To redefine perceptions of the educator profession, we produce short videos that focus on lesser-known aspects of teaching. Check out our videos for yourself, then share the ones you like on Facebook and Twitter! If you have an idea for a video, we'd love to hear it and collaborate with you! Just contact us! If you're a teacher, there are definitely times when you've had a bad day or maybe you've been discouraged about something related to our jobs. It's so important we don't let the negativity overwhelm us. We've got to stay positive and the best way to do that is to post positively about our profession on social media sites. Maybe you received a heart-warming thank you note from a parent or student. Or maybe you had a great lesson and your kiddos were having a blast in class! Perhaps your class or club took a field trip to an incredible destination? Well, when you post pics and updates, use the hashtag #TeachLikeMe! It's your message to the public declaring that you love what you do and you encourage others to do the same! So, this is the whole basis of the campaign. Historically, we educators haven't done a great job of convincing others to become teachers. We encourage kids who are great at math and science to pursue "better" careers as engineers and researchers. We discourage our own children from following in our footsteps, often citing low pay. In all of this, we are not replacing ourselves and hurting our profession. Our profession desperately needs a public relations overhaul and it starts with us speaking more positively about the career we love! We literally need to say to others, "Teach like me!" Teachers have the best job in the world because WE say so! "The pay is too low, I don't feel respected, and I don't feel like I have control." You're not alone! We're all in the trenches working together, going through the same struggles. Gone are the days when you could put your head down and just go with it. The Teach Like Me Campaign aims to inject positivity and optimism into our profession, but it's not turning a blind-eye to the challenges we educators face in the political arena. We need you to speak up and stand up in education policy conversations. It's all about the angles, though. It is so imperative that we educators maintain a positive outlook and approach the issues with a solution-oriented mindset. Bottom line: be informed and vote accordingly. Whenever you're shopping or eating out, ask if the business offers an educator discount. We're sure you might be apprehensive about this, but you'll be surprised at how often businesses offer educator discounts! The worst that can happen is they'll say no. But once you find businesses that do offer educator discounts, be sure to show them some love and continue to support their business! Spread the word on social media and take teacher friends with you to shop and eat out at the places that support us. We've listed some businesses that currently offer educator discounts, but if you know of others, contact us! Every year, we hold the annual #TeachLikeMe Day on National Teacher Appreciation Day in May. We know that teacher appreciation starts with us, so prior to Tuesday May 3rd, 2016, be sure to sign up to participate for our event on Facebook. We also ask that you change your profile picture on social media sites to one of our custom logos (available on our Profile Pics page) at least one week beforehand. Then, on May 3rd, we ask that you post positively about the educator profession and include the #TeachLikeMe. The goal is to fill up newsfeeds with all the things we love most about our job!